Water Resources, Watershed Information, and Stream Projects. 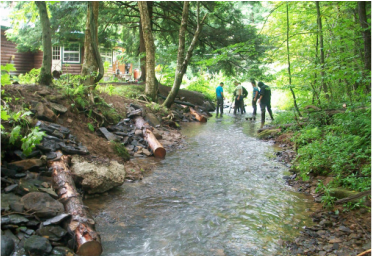 The McKean County Conservation District has an ongoing Streambank Stabilization and Fish Habitat Project program. 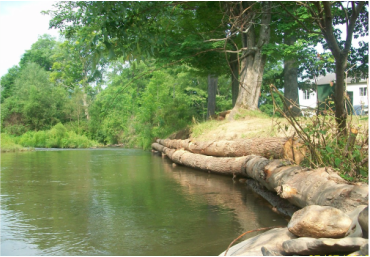 This work addresses streambank erosion problems which result in pollution to county streams. Soil loss and sediment from eroding banks has serious impacts on aquatic life, clogging the gills of fish, killing food sources for larger fish. Streambank stabilization structures hold soil in place and provide a growing location for plants and shrubs, which helps stabilizes the bank with root systems. Structures re-direct the flow of the stream back to the center. This creates deeper pools of water, which are needed by fish for feeding, rest, and breeding. Do you have an eroding streambank on your property? The first step is to prevent additional erosion by allowing nature to regrow vegetation meant to hold the streambank. Native dogwoods, willow, and other shrubs develop root systems and hold the soil in place. Do not mow to the edge of the stream. Grass alone does not have deep roots to hold the soil, as shown in the photo to the right. Establish a riparian buffer along the stream planted with native shrubs and trees. The buffer can be fenced to exclude livestock if necessary. This will also prevent soil loss and damage from erosion while protecting the stream with a living filter of plants. Landowners can contact the Conservation District to learn more about streambank protection on their property. Landowners wishing to improve their streambank on their own should contact the office for permitting needs. Permits are not required for plantings, but are needed for bank or in-stream work. ﻿A watershed is an area of land over and through which water flows to the lowest point - a stream, river, wetland, lake, or ocean. Watersheds catch rain or snow melt and funnel water into flows across or under the landscape. They come in many different shapes and sizes. Watersheds can be hilly, mountainous, or nearly flat and can be comprised of many land uses including forests, farms, towns and cities. Most of McKean County is in the Allegheny River watershed, with a smaller portion in the southeast corner in the Susquehanna River watershed. Protecting our watersheds means clean water in our streams. Clean water in our streams means healthy drinking water in our homes, safe water activities, such as swimming and boating, in our backyards, and abundant wildlife and natural resources in and around our aquatic environments. Clean water is essential for life. Threats to our clean water do not follow political boundaries, but occur within watersheds. No matter where we are, we are always in a watershed. 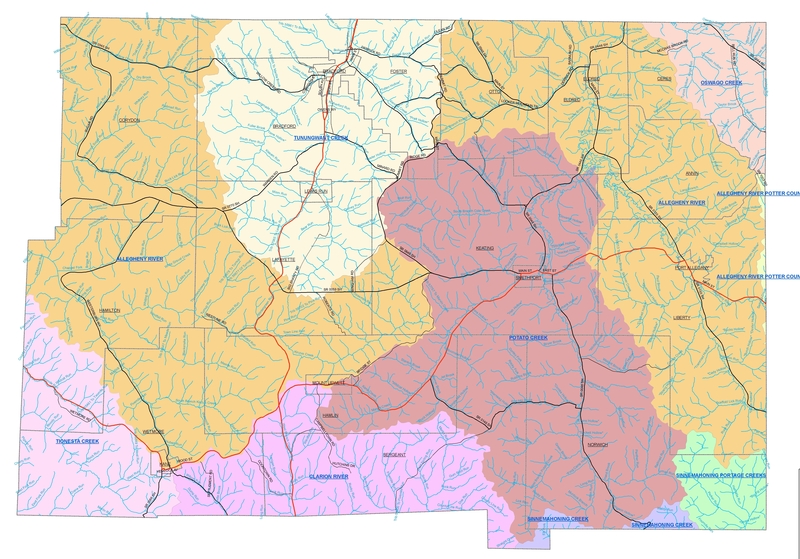 Look at the following map of McKean County and determine your watershed address. A watershed address is the name of the watershed in which you live. Wetlands are defined as areas where ground and/or surface water lingers for periods of time. In Pennsylvania, they are protected by both state and federal regulations and may also be protected by local regulations and ordinances. Wetlands are valuable because they function in ways that benefit the natural world, including the human community. Wetlands are important for wildlife, protection or water resources, and for water infiltration. Are wetlands present on my site? This is a commonly asked question at the Conservation District. If a project or development is planned, a professional consultant MUST be hired for a wetlands delineation to determine if wetlands are present. For general information, not related to projects visit the PA Department of Environmental Resources Fact Sheet or the document on wetlands below. There are two types of water resource pollution, Point Source and Nonpoint Source. Point Source Pollution is a direct discharge into a river, stream, lake or pond. Examples of Point Source pollution include a sewage treatment plant or an industrial wastewater discharge. Point Source Pollution is regulated by state and federal agencies to minimize the probability that water resources will be negatively impacted. One of the requirements for projects proposing to discharge wastewater is to get a National Pollution Discharge Elimination System (NPDES) permit. Development sites proposing earth disturbance must also have an approved Erosion and Sediment Control plan. Nonpoint Source Pollution is pollution that enters our streams, lakes and ground water from diffuse sources. An example would include stormwater runoff that can pick up sediments, nutrients, pesticides, herbicides, fertilizer, animal waste, petroleum, litter and all sorts of other things on its way to our waterways. Learn About Your Watershed - Contact your local watershed group or County Watershed Specialist and find out about your watershed. Become Active in Your Watershed - Find a watershed organization in your community and volunteer to help. If there are no active groups, consider starting your own. Become a Volunteer Water Quality Monitor. Help collect water quality data and build stewardship for your local waterbody. Organize or join in the cleanup of a stream, river, or wetland. Create a wildlife habitat in your backyard. Maintain vegetated buffers along streams on your property and in your neighborhood. 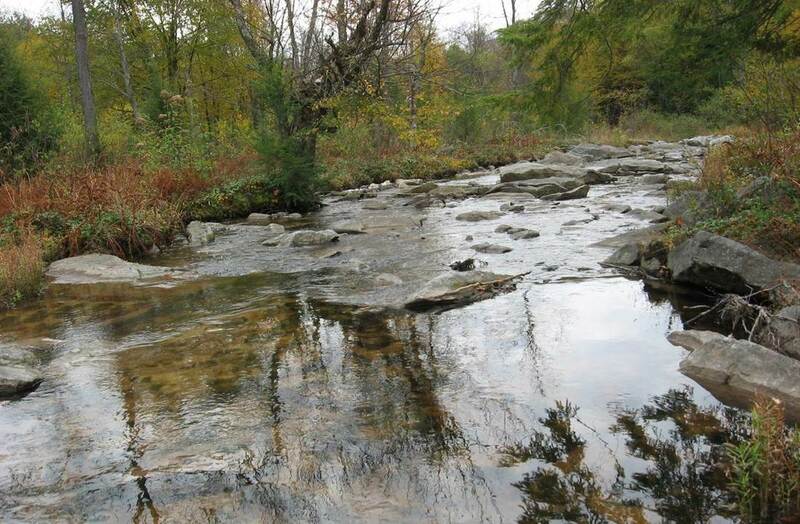 Forested buffers along our streams and other bodies of water reduce impacts caused by runoff flows, intercept sediments, take-up excess nutrients and other pollutants, moderate stream temperatures and increase wildlife habitat values. Preserve wetlands on your property and in your neighborhood. Wetlands have numerous water quality and quantity values when looked at from a watershed point of view. Wetlands store stormwater, slowly replenish groundwater aquifers and filter sediments and other pollutants. Wetlands also provide critical habitats to many of the regions rarest species of plants and animals. Manage stormwater runoff from your property. Direct runoff to a low point on your property and detain it in a grassy swale or rain garden. Direct rooftop runoff onto lawn areas, or rain gardens, not the driveway. Do not dispose of anything into curbside storm drains. Many times these drains lead directly to receiving streams. 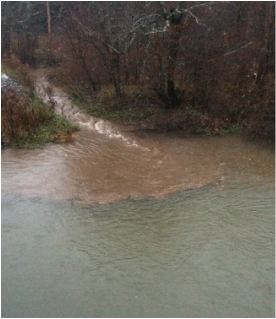 Even during dry weather the stuff you put down the drain will get into the stream the next time it rains. Help Increase Public Awareness in Your Watershed.